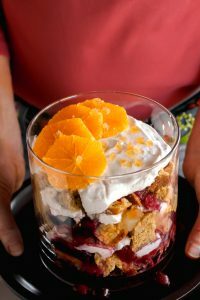 Layers of cranberries, pear, orange, yogurt, ginger and cornbread make this Cranberry Orange Cornbread Trifle recipe a trifle to remember! Looking for a recipe to serve for the holidays? See if this fits your requirements: Make ahead, economical, enough substance so that people aren’t hungry an hour later, and on the healthy side. 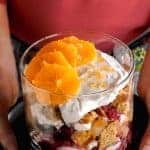 Meet Cranberry Cornbread Trifle. My gift to you! A breakfast dessert recipe. Just about anyway you make it, a trifle is a celebration. An English dessert with layers of sponge cake, whipped cream, custard, sherry or brandy, fruit and jam showcased in a clear glass bowl. Most wouldn’t tinker with a traditional trifle. Leave that to me. 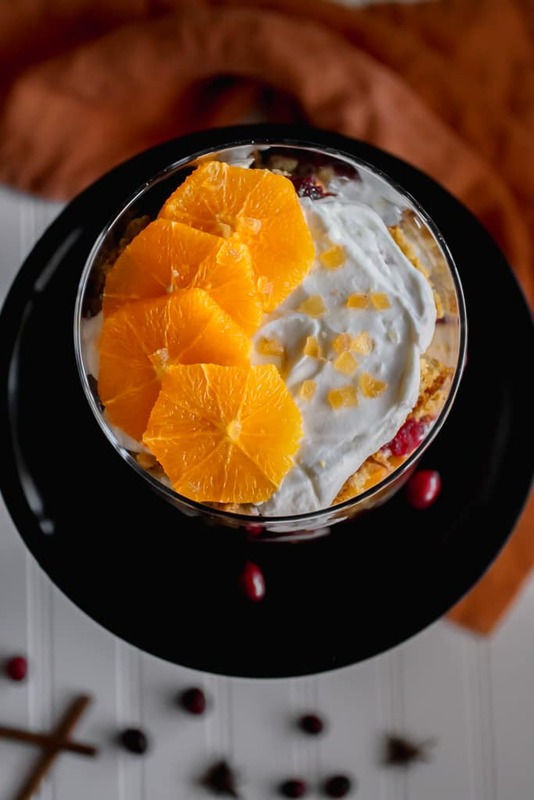 Layers of cranberries, pear, orange, yogurt, ginger and cornbread take trifle to a sparkling new level. A recipe that delivers something tasty and healthy. Cranberries’ tart flavors keep this from being too sweet and their crimson color delivers healthful compounds that may reduce inflammation and help with overall health. Yogurt replaces whipped cream with creamy protein and calcium. I like siggi’s Orange Ginger yogurt in this recipe. Pear and orange add flavor plus fiber. Cornbread replaces the sweet cake bringing the sugar down. This cornbread recipe uses whole-grains giving you more fiber and protein. The trifle can be assembled the day before you serve it, so takes some last-minute holiday busyness away. Plus the time in the fridge improves the flavor. These foods appear on many holiday menus, so can be a way to repurpose leftovers. Or given as a gift in a hand-blown crystal bowl. The red color seems perfect for fall and the holidays, but even more, that color comes from anthocyanins, which makes them a powerful health contributor. Cranberries help reduce urinary tract infections and inflammation while boosting heart and gut health. The darker red the cranberry, the more ripe and less bitter they are. 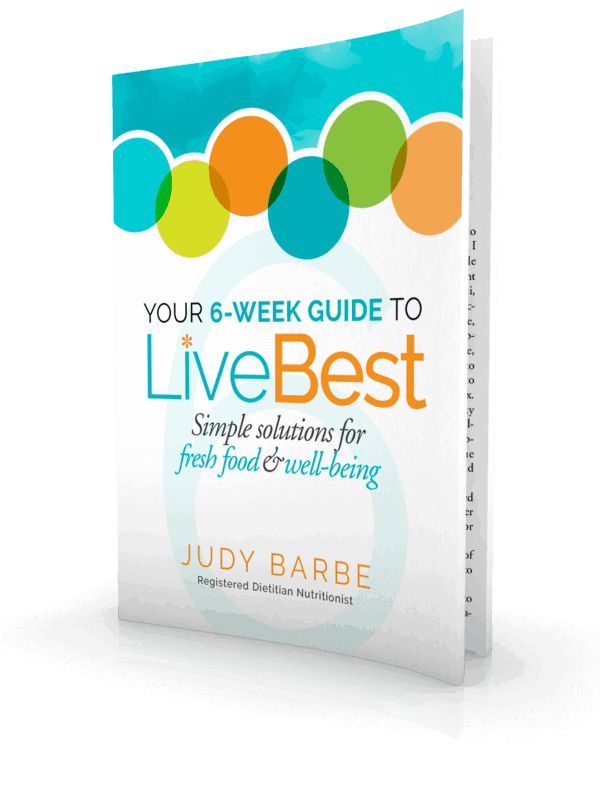 Before you use them, pick out shriveled or mushy ones. Fall is harvest time for North American cranberries. Fresh cranberries will keep up to 2 months in the refrigerator. You can enjoy them all year, just store the bag in the freezer. They’ll be good until next year. No need to thaw. Use the frozen fruit as you would fresh cranberries. These are a quick cooking berry, in 10 minutes or so, when they pop, they’re about done. Cranberries only take about 10 minutes to cook. In this recipe I combine the fresh cranberries with water, sugar, orange juice and spices in a medium saucepan. Heat everything over medium heat until mixture boils, then reduce heat to low, stir and cook 10 minutes. 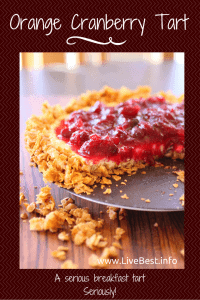 Here’s another cranberry recipe: Orange Cranberry Tart. If you like the recipe share it on Facebook, rate it below or save it to Pinterest so you can find it again later. 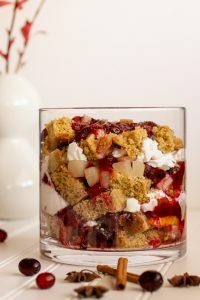 Layers of cranberries, pear, orange, yogurt, ginger and cornbread make this a trifle to remember! Cook: Combine cranberries, water, sugar, orange juice and five spice in a medium saucepan. Heat over medium heat until mixture boils. Reduce heat to low, stir and cook 10 minutes more. Set aside to cool. 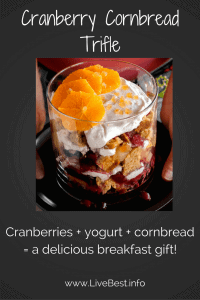 Trifle: In a bowl, layer cornbread, cranberries, yogurt, pear, orange, crystallized ginger. Repeat. Five spice is a spice blend often used in Chinese cooking. Find it in the spice aisle or order online.